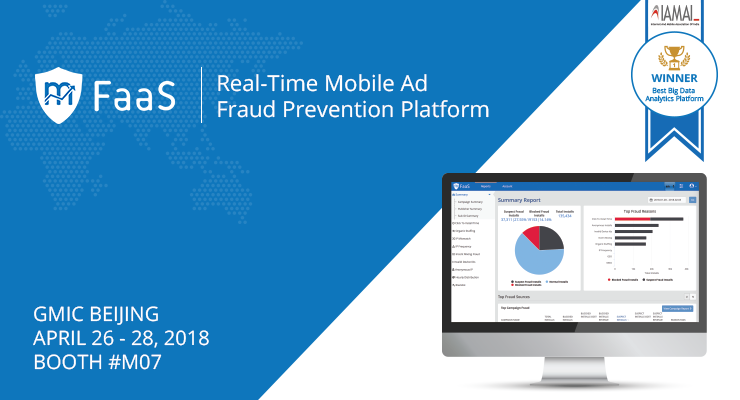 Affle a Singapore HQ mobile audience intelligence and analytics platforms company today announced the launch of its Fraud Analytics As a Service Platform &dash; "mTraction FaaS" to help the marketers globally to fight mobile ad fraud. According to industry data sources close to USD 16.4B is lost globally due to ad fraud. mTraction FaaS or mFaaS aims to help marketers detect fraud, not at a post mortem level but during run time, thus minimising wastage of precious marketing dollars. mTraction FaaS aims to detect and eliminate the growing fraudulent practices in the mobile performance marketing industry. Anuj Khanna Sohum, Founder, Chairman & CEO of Affle, on the launch of mTraction FaaS said, "We are extremely excited to announce the launch of this platform as it helps us to address an important and growing problem area for marketers globally. Over the last year our teams have done extensive research over billions of data events to build robust and reliable algorithms to help detect, highlight and eliminate multiple types of ad fraud. mFaaS has been designed on 2 key technological pillars, Artificial Intelligence and Machine Learning along with Blockchain technology which helps its data engines to process huge amount of data and detect fraud patterns using 15+ reason codes. We believe that the timing of this launch is also very pertinent as we are seeing significant growth in ad fraud leading to ROI erosion for top marketers. In fact, we are now inviting some of our marquee partners to start using mFaaS on a pilot basis so as to check the reliability of their traffic sources and also understand how mFaaS can add value to enhance their marketing efficiencies." Speaking on mobile ad fraud, Mr. Takayuki Hoshuyama, President & CEO of D2C Japan said, "Ad fraud is one of the ongoing big issue which getting attention for both Advertisers and Agencies now. Alone in Japan millions of advertising budget is wasted due to advertising fraud. mTraction FaaS, a robust platform developed by Affle is aiming to help the advertisers not only to detect but also protect from fraud sources, hence helping them attain positive ROI from their marketing budgets. The advertising eco-system needs to come together and work with such technological platforms to solve this problem"
Addressing the same, Rajat Basra, CEO of Omnicom Media Group, Indonesia commented, "As much as digital media has been nimble to reach the most relevant audiences & drive higher conversions, it has also been marred by fraud players & practices. mTraction FaaS is great initiative for the industry overall, and advertisers in Indonesia & SE Asia will surely be benefitted by such a service. Ad fraud remains a top concern regarding digital media planning among brand marketers and media agency. Using real time actionable data to boost higher quality transactions is a need of the hour, and will also benefit the publishers/ platforms that have been following the best practices." Speaking on launch of Affle's mTraction FaaS, Shubhodip Pal, Chief Marketing & Commercial Officer Micromax Informatics, said, "Ad Fraud is a growing menace in the fast-growing digital advertising industry. The industry really needs robust platforms to detect and eliminate fraud and that will ensure continued growth for the industry. We thus welcome Affle's launch in this domain and wish them all the best." mFaaS platform is currently available in English, and shall soon be made available in several other languages like Japanese, to help the mobile marketers globally. mFaaS in its current version is expected to help in significantly cleansing the mobile performance marketing industry and will soon grow in scope to address other forms of fraud use cases in digital advertising. mFaaS is easily integrate-able using SDK and APIs and can also be integrated with the leading third party attribution platforms. Check this product video for more details.